Do you want to introduce your kids to sea life? Does he seem fascinated by squids and octopi? 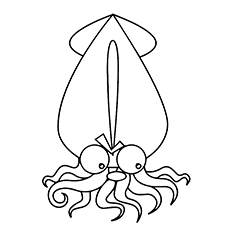 If you nodded along, you could try getting him some squid coloring pages printable. The vast and deep oceans have many exotic and mysterious aquatic animals, and one of them is the squid. Squids are fast moving animals found abundantly in the Atlantic. The 300 species of squid fall into two main categories- myopsida and oegopsida. Read our post and get these amazing coloring sheets for your kid today. 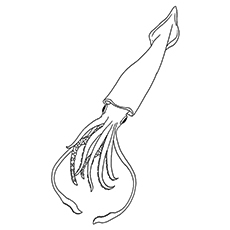 Get your child familiar with the Humboldt Squid with our coloring sheet. Unlike its name, Humboldt Squid is not as long as you would think. It is only 7 feet long and weighs up to 100 pounds. The Humboldt Squids enjoy cold waters, so you will rarely find them in tropical regions. 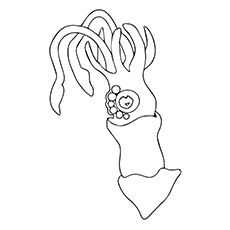 Here is a beautiful colossal squid coloring page. It is also the largest species of squid in the whole world. It can weigh up to 11000 pounds. Did you know that the eyes of Colossal Squid are bigger than any other creature on earth? 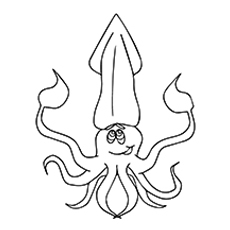 Take your child for a trip to the Atlantic Ocean with our squid coloring sheet. Your kid will learn significant skills like hand-eye coordination and fine motor while coloring the diagram. Make sure your child chooses some vibrant colors to make this squid come alive. Here is a cartoon image of the Japanese Flying Squid. It has features that are distinct to the species. The Japanese Flying Squids have ring round the back of their head. Even the cartoon image of Japanese Flying Squid looks very creepy. The Japanese Flying Squid uses his tentacles to crush his prey and eat them. Giant Squid, as the name implies, are gigantic. The female squids of this species are almost 10 feet longer than the males, the average length being 43 feet. 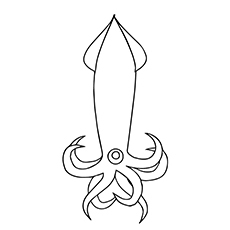 The overall design of the Giant Squid is almost the same as other squids. The Giant Squid also has an amazing ability to regenerate their tentacles. 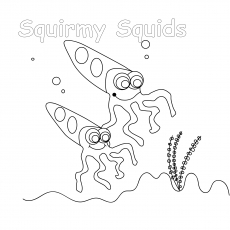 Here is a cute ocean scene featuring the Squirmy Squids. These Squirm Squids are having a great time hanging on the ocean floor. These jolly squids will surely put a smile on your child’s face. In the meantime, teach him all about the underwater animals such as octopus, sharks and whales. 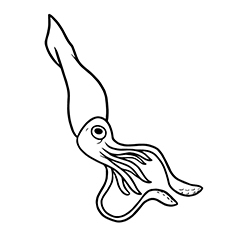 Here comes one of the adorable baby squid colouring pages, using his tentacles to push himself through the water. Your child will have a blast adding colors to the spots on his head. Tell him to make an ocean background to go with the picture. Get tropical with our coloring sheet featuring the Vampire Squid. The sinister name of these squids comes from their appearance. They have jet-black bodies, webbed arms and glowing red eyes. Despite their appearance, the vampire squids are docile in nature. Here is one of the interesting squid pictures to color. 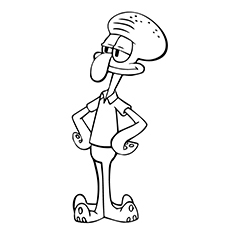 Squidward Tentacles is the tritagonist of the “SpongeBob Squarepants” series. He is the neighbor of SpongeBob and Patrick. Squidward works as a cashier at the Krusty Krab, a restaurant in the Bikini Bottom. He is a selfish guy who feels he is superior to others. The adorable squid you see here is Pearl. She is one of the Mr. Ray’s students. 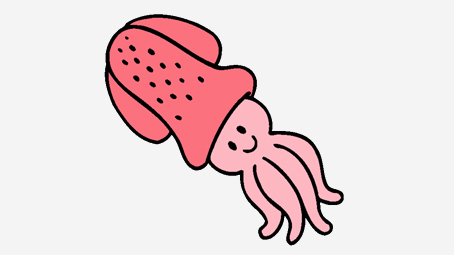 She is a pink colored squid who has one tentacle shorter than the rest. Whenever Pearl gets nervous, she squirts her ink. Pearl is an outgoing, no-nonsense squid, who gets scared easily. 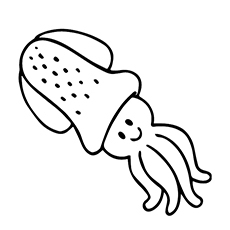 These free printable squid coloring pages will surely take your kid on an underwater journey. 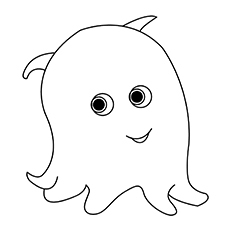 Make sure you feed them with facts about squids while coloring the sheet. Which one is your child’s favorite marine animal? Tell us by commenting below.